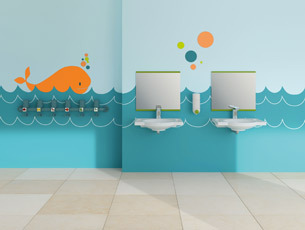 Sanitary rooms for children must be designed to be practical, easy care and safe. HEWI products for children are matched to the needs of their small users, whether in child daycare centres, kindergartens or schools. Cheerful colours create a child-friendly ambience. 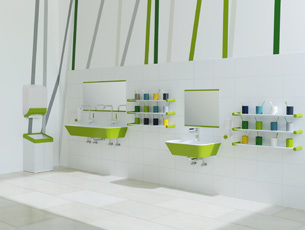 Washbasins, mirrors and tumbler racks with apple green accents now provide additional scope for coloured design in the children's bathroom. The washbasins are available in two different sizes. 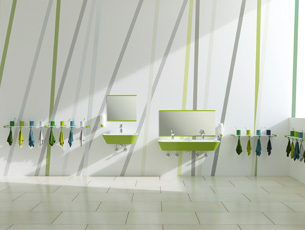 As a single washbasin or as a practical double washbasin. 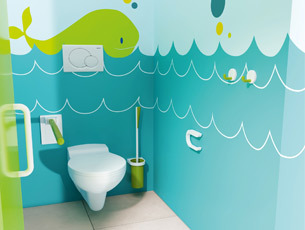 The narrow edge and compact design allow even small children to reach the fitting effortlessly. Gentle radii means no corners or edges on which children could bruise themselves. They are optionally available in classic white or as a two-coloured variant with an all-round strip in cheerful apple green. The mirrors made of ESG safety glass have a shatterproof film. 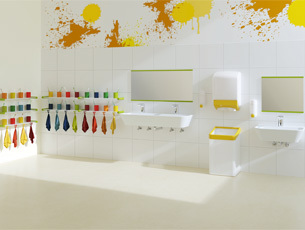 They are available in two different sizes to match the washbasins. Here the fresh accent in apple green is set by horizontal bars. The practical tumbler racks can be extended as required with by adding an add-on module with four additional spaces. The tumbler rack is optionally available with towel hooks. The opening of the shielded handtowel hook is positioned facing the wall for safety. For individualisation and simple allocation of the tumblers, additional self-adhesive stickers, writable or with printed motifs, are available. Like the tumblers, the labels are dishwasher safe.